In constructing this website, the two authors (Becky and Sue) disagreed on whether to include commentary along the way. The goal, after all, was to provide a true account of events as they unfolded from 1985 to 1988, based on the plethora of reports, journals and other documents written at the time and saved for posterity. So the decision was made to exclude commentary. Comments added in hindsight could result in a nuanced version of the text. Viola … was an exception. Being such an exceptional individual, it is impossible to write dispassionately about her. Viola touched our hearts in a special way. She stayed with us throughout the life of the Project and the last three years of her own. When all is said and done, this then becomes a story about PEOPLE – as much as it is about newspapers. Not much has been written about the people in the background and the connections forged as Project staff scoured the countryside in search of historical newspapers. 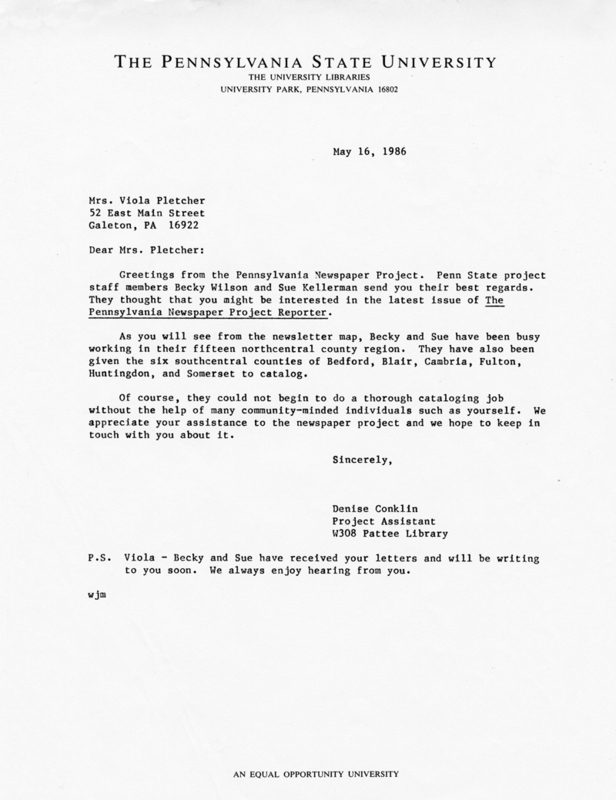 Then along came these two green outsiders from Penn State, bringing with them a passion and concern as great as their own – for locating and preserving these files. Folks knew, in that instant, that others cared as much as they did about the welfare of the deteriorating collections. They opened their doors, their libraries, their societies, their homes and their hearts to us. We took their passion for saving newspapers to state and national levels. This Project is a tribute to those people who knew its significance before it even happened. 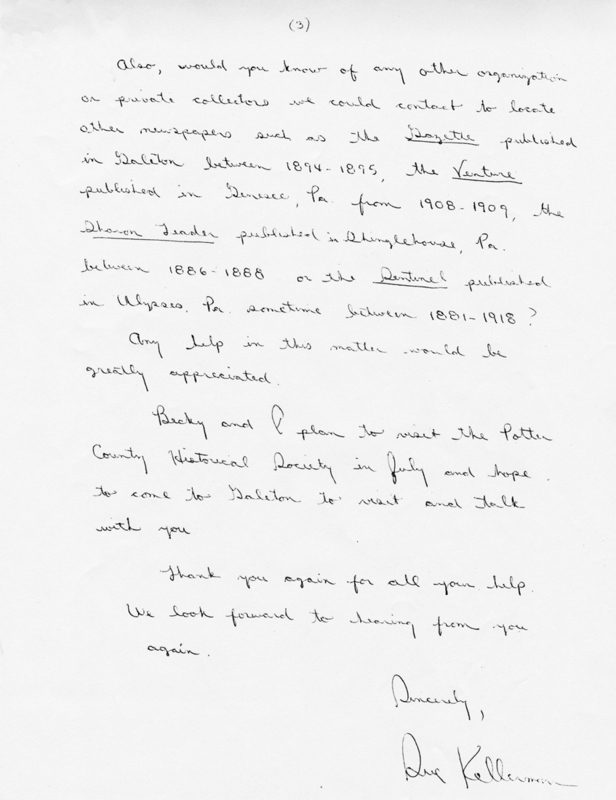 NEH funding and local individuals ultimately made it all possible. Project staff were to be the instruments. And Viola was so very special. 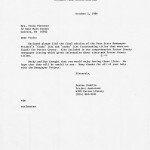 We contacted her in early February 1985 after her name had been given to us by a Galeton Library staff member. We were told that Viola had extensive knowledge of newspapers and their history. And indeed she did. A pioneer in the field and an ex-newspaper woman, Viola worked for several newspapers in Potter County as early as 1936. She worked as a news reporter and as a circulation manager for the Potter Enterprise. 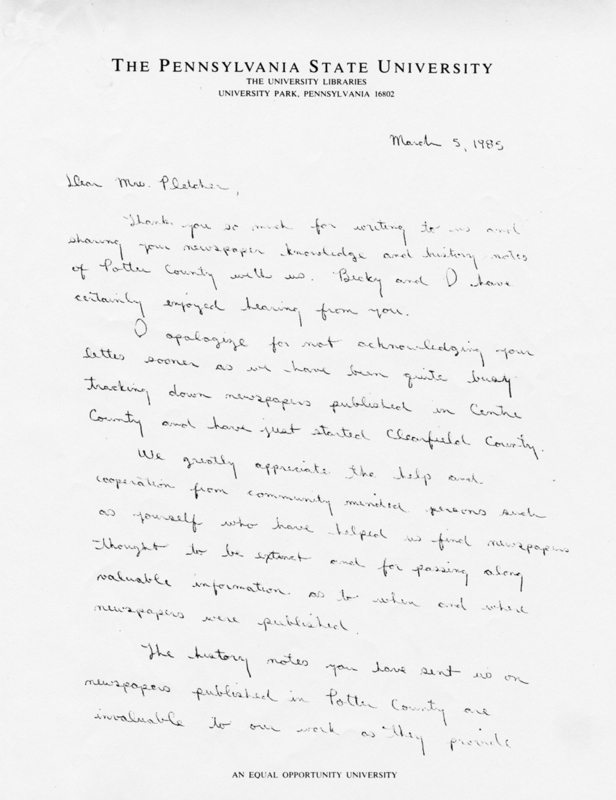 Along the way, she acquired facts and information about newspaper titles which she graciously shared with us. Her knowledge helped significantly in creating our title histories for Potter County publications. Viola also held various positions in the Borough of Galeton where she lived. 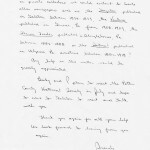 We began receiving letters from Viola as early as February 1985. She was an 89-year-old resident of Galeton, Potter County. Thus began an abiding friendship and exchange of information that would last for the next three years. The only contact who stayed the entire course, Viola maintained her ties with us until the very end. Regretfully, we only managed to visit her once as the second planned visit was aborted by a car too sick to travel. 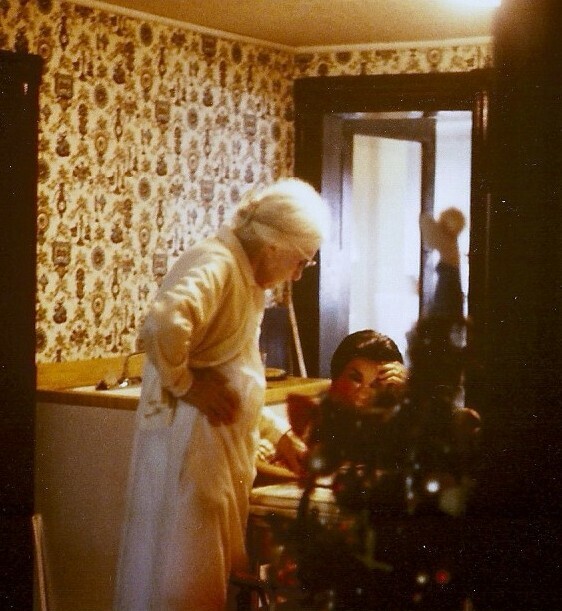 Looking back I sorely wish we had made some other arrangement – knowing now how much she looked forward to our visits. 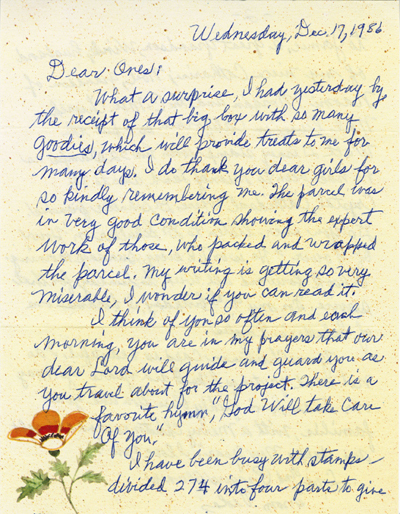 Her letters below leave no doubt that she wished to remain connected to the work she cherished, that gave meaning to her life. 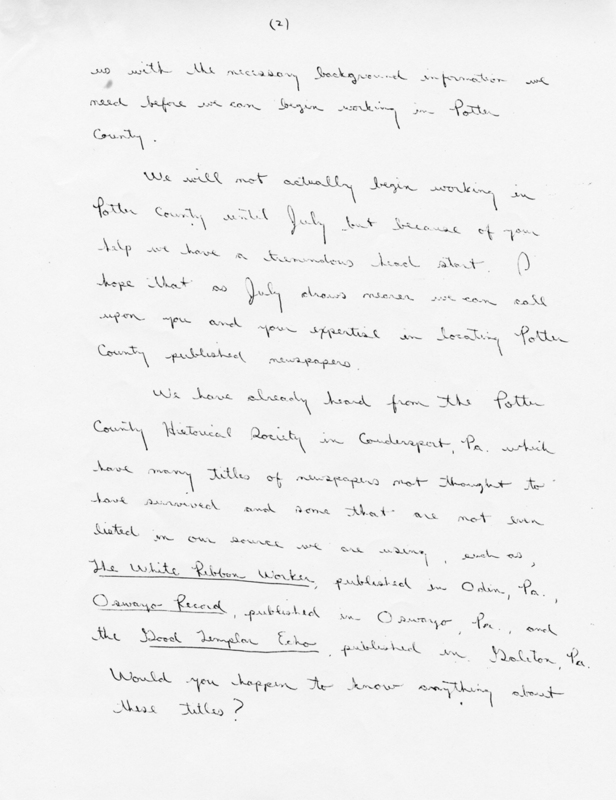 Many of her letters included news articles about the birth and demise of various Potter County newspapers – she followed them all and diligently kept us apprised of this valuable information. With Viola, it became Up Close and Personal. She created memories that we will cherish forever. 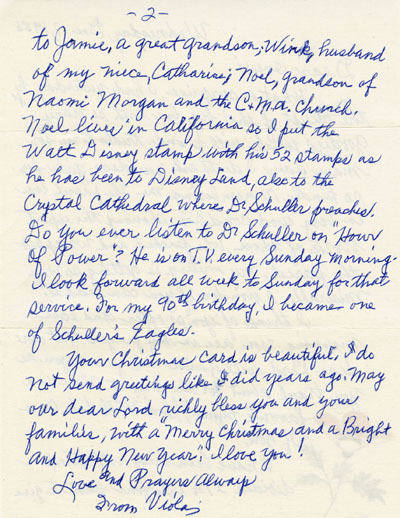 Note: Viola’s letters are included with the approval of her granddaughter, with whom we spoke in September, 2012. 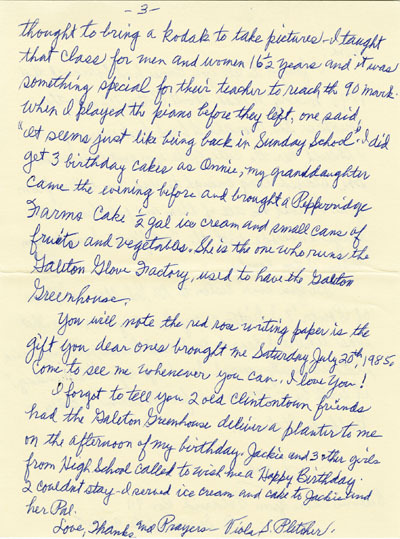 …Received 2 letters today – one was from Mrs. Viola Pletcher, Galeton, Pa., 89 years old. 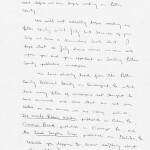 This is our third letter from her. 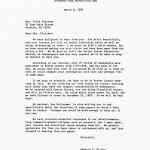 We thought it was time to finally acknowledge her letters. 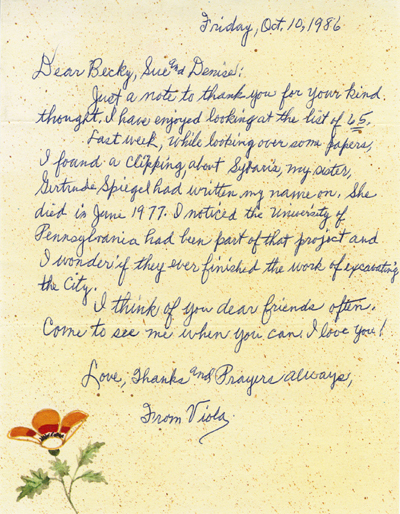 Becky wrote letter to her, and I wrote to her too…. 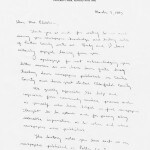 Letter to Viola from Becky, responding to her letter about the Project, March 6, 1985. 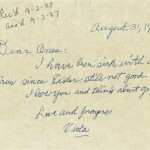 In her letters, Viola often apologized for her handwriting – which was quite remarkable, all the more so as she was 89 years old at the time. Tons of things to do – I began cataloging Columbia Co. – finished 20. Becky and I decided to spend time now searching for titles in Potter County– and visiting Viola so, Becky called Potter Co. and set up sites to visit – July 19 and 20th – will drive up Thursday afternoon. 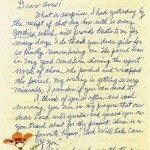 Becky worked on writing Thank you letters to 28 people (had done some at home over the weekend). She also worked on and finished the Monthly Report for June. I finished gathering stats on brief workforms to be included in the Monthly Report. Pulled Potter Co. titles from brief workform box, gathered more info on Potter Co. newspapers – searched stacks. All ready to go to Potter Co. on Thursday. 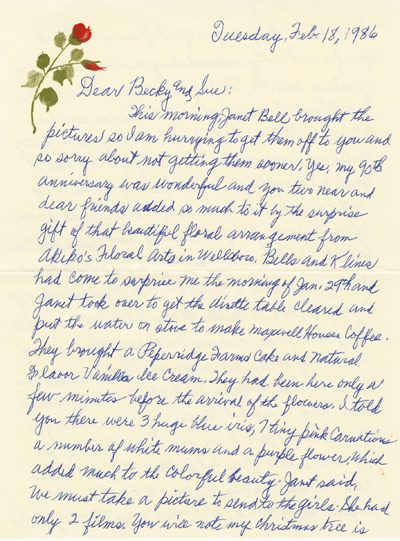 Received another letter from Viola – will see her on Saturday, 7/20. 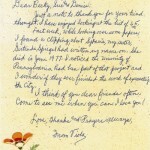 …Left for Potter Co. at 10:30 – took us 2 hours to get to Wellsboro (Tioga Co.)… ate lunch at Penn Wells in Wellsboro. Back on the road headed to Galeton. What a small town Galeton is – about 6 buildings make up the town. Dropped in at Galeton Public Library – picked up 4 titles – then went on to Community Center down the road where Library had additional newspapers stored. 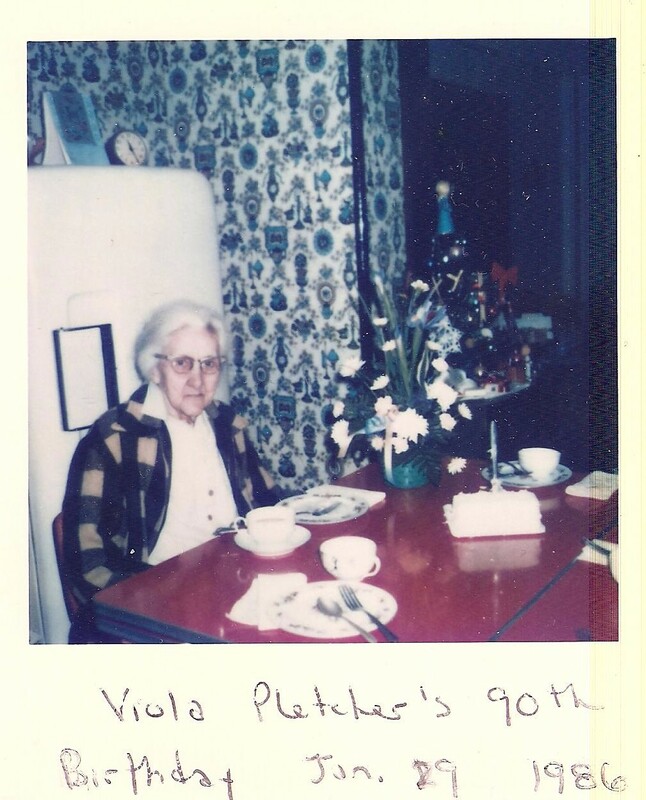 Visited with a nice older lady at Library who knew Viola Pletcher – I guess Viola had talked to her about us. Up by 7:00am, ate breakfast at Laurelwood – off to Potter County Historical Society. Arrived at 8:45 worked till 9:45 on microfilm collection – Completed and verified holdings on microfilm for 9 Potter Co. titles. This finished inventorying and cataloging Potter Co. Hist. Society holdings. Left for Coudersport Public Library – we were there 10:15 – 10:35. 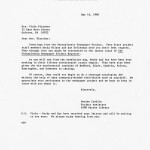 Verified microfilm holdings for 7 Potter Co. titles. Had time for some shopping in Coudersport and lunch at Hilda’s and Jim’s then drove to Galeton to visit Galeton Public Library to pick up ending date of Leader-Dispatch (Galeton) and to visit w/librarian Jane Churchill. Had nice visit w/her then headed down the road to visit w/Viola Pletcher. Arrived at Viola’s house at 1:30, we stayed until 4:00pm. LDRed one title she had, looked at several histories she had, looked through old photo album w/early Galeton pictures, and toured around her house – she showed us everything. 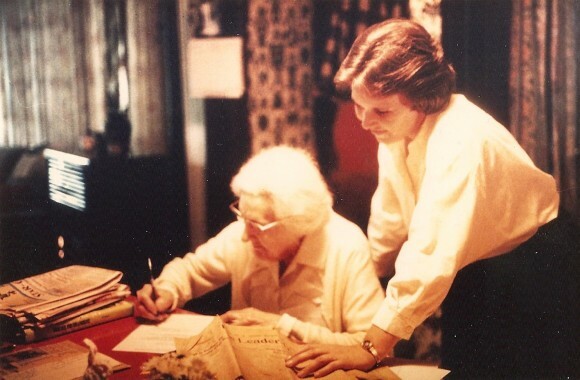 Viola Pletcher signing her Release Form July 20, 1985. Viola had given us drink and cakes the minute we got there – she had been waiting all day for us to arrive – was slightly shook-up – glad to see us, when we arrived – didn’t know what to do first. Also – Viola took time to play 12-15 hymns on the piano for us – she played beautifully. All in all had great visit – will keep in touch. Gave Viola a gift before we left – stationary. 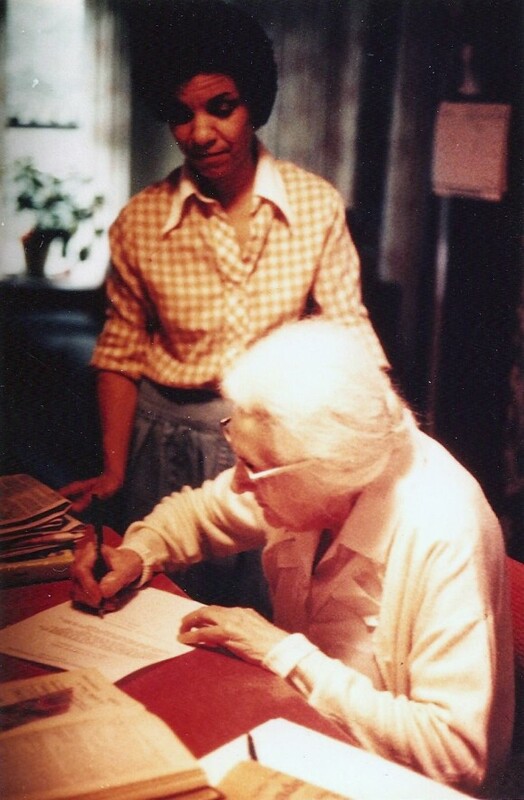 Viola signs her Accessibility Agreement while Sue looks on July 20, 1985. 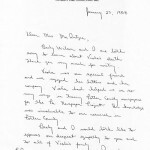 Viola reviews Potter County title changes with Becky, July 20, 1985. Beck called Viola – she is fine! 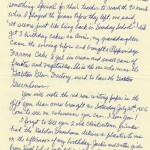 She was waiting to get pictures from her 90th birthday before she wrote to us. 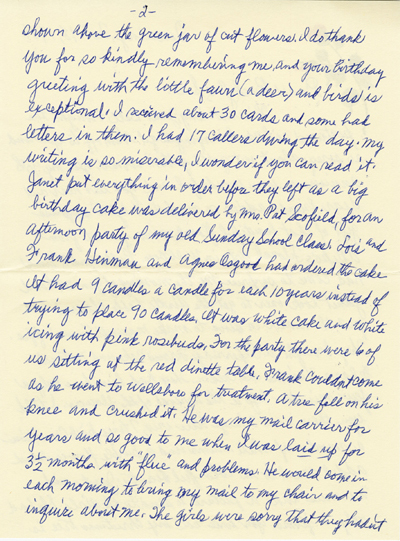 Letter from Viola to Becky and Sue, giving an account of her 90th birthday! See the article Viola sent us announcing a new Potter County title below. 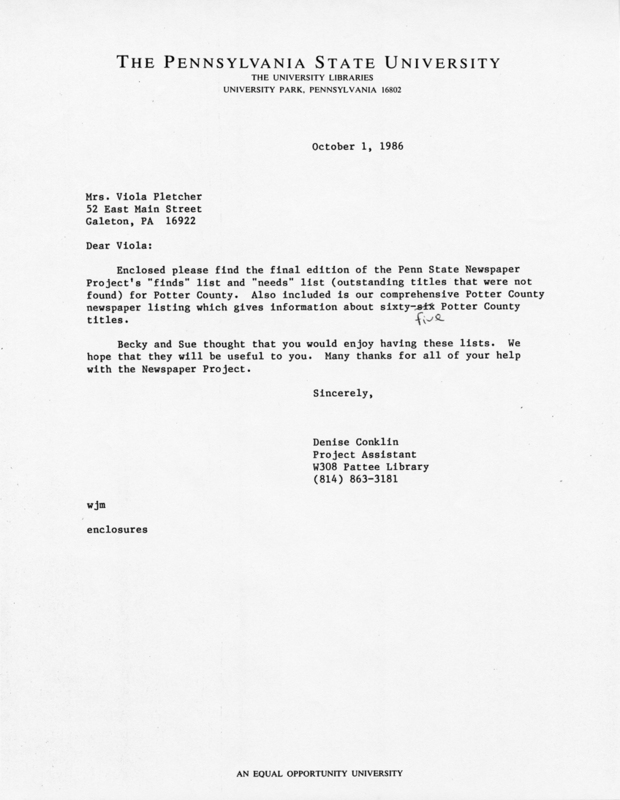 Thanks to Viola Pletcher we were able to include this NEW Potter County title in our PA Newspaper Project inventory. 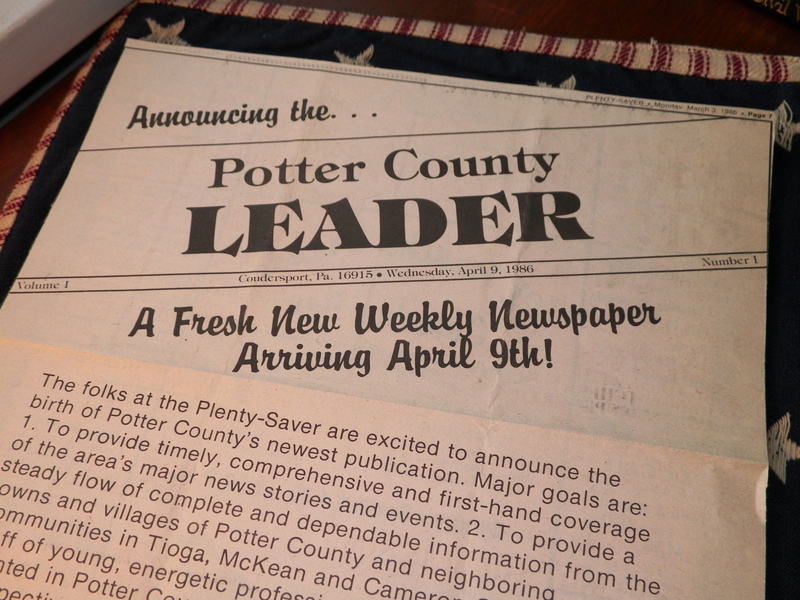 However, as happens to many newspapers, by September 2, 1987 The Potter County Leader ceased publication when it merged with the Potter Enterprise to become The Potter Leader-Enterprise. Article about Viola in the Potter County Leader, Coudersport, April 23, 1986. …Called Viola and told her we’d be coming on Saturday. She was very happy to hear from us and is looking forward to our visit! 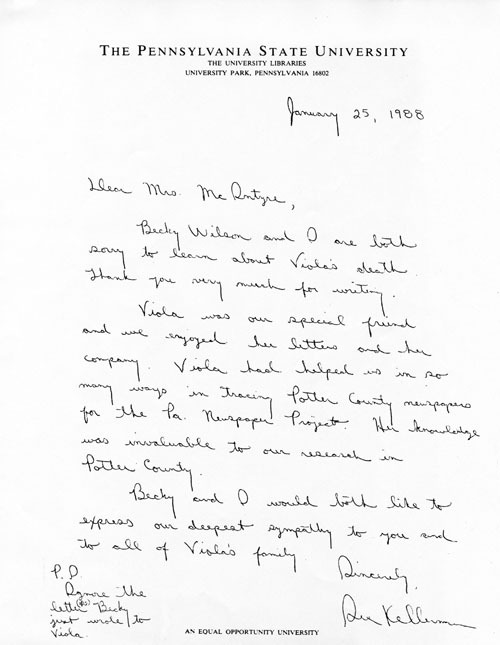 …Oh — because of [my car] having problems — we decided not to go to Potter Co. to see Viola or to stop by the Potter County Leader. In retrospect, we realize the importance of our contact with Viola over the life of the Project. Although we gave what time we could, I wish we had done…so much more. How do you measure the impact of your actions on someone’s life? 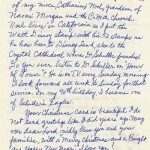 Sent Birthday card to Viola – 91 years old! 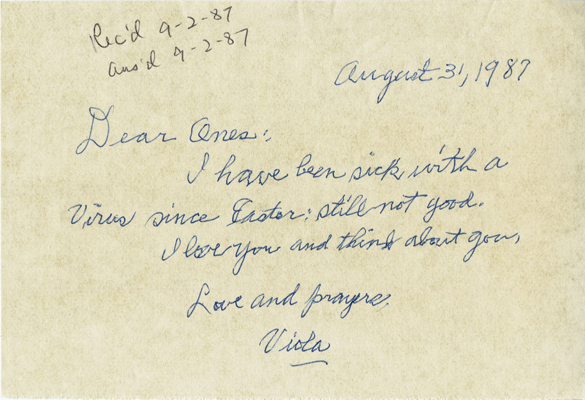 Note from Viola, informing us that she had been ill… August 31, 1987. 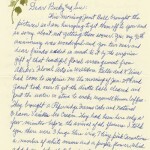 Received letter from Viola’s granddaughter. Viola died 1/15/88. 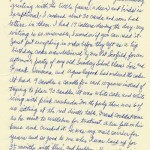 I wrote a letter back to the granddaughter. I also called Beck and told her the news. 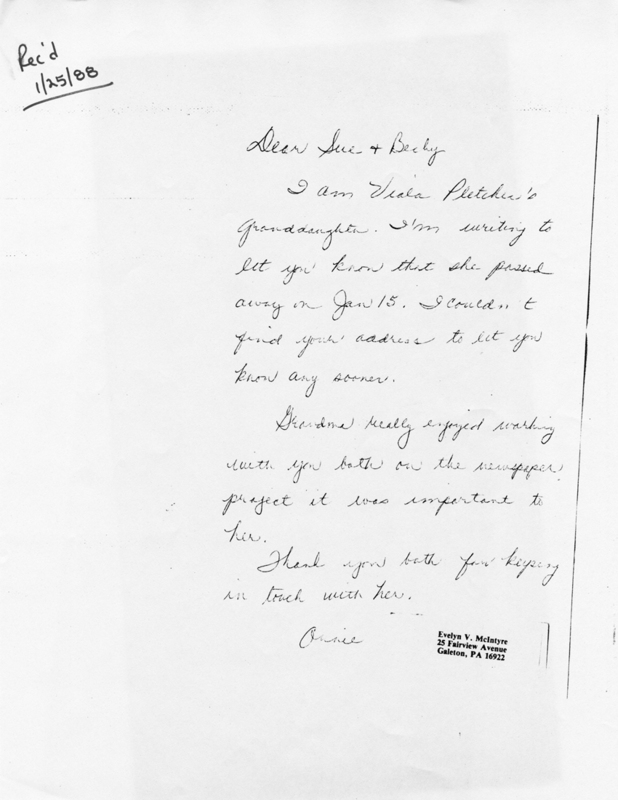 Viola was a good person and very knowledgeable about newspapers in Potter County. 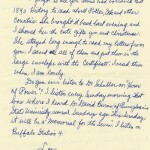 Letter from Viola’s granddaughter Annie, received January 25, 1988. 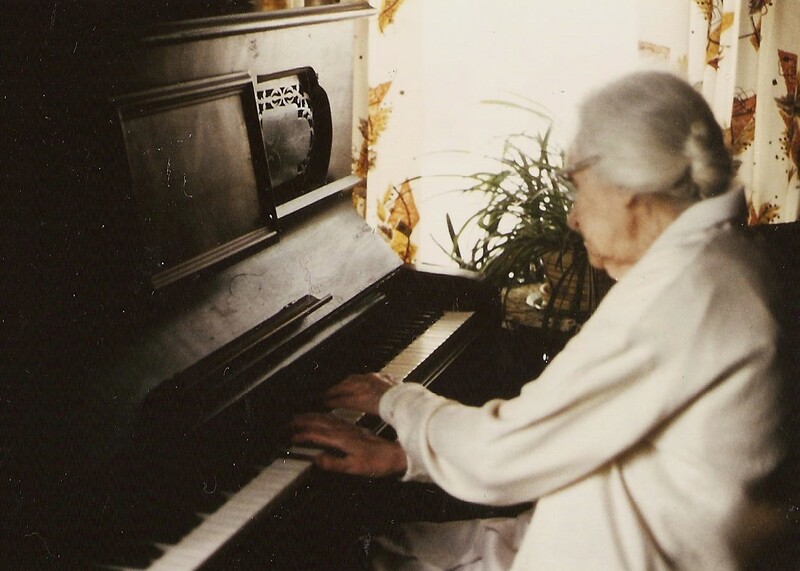 Viola was born January 29, 1896, and died 14 days before her 92nd birthday on January 15, 1988. 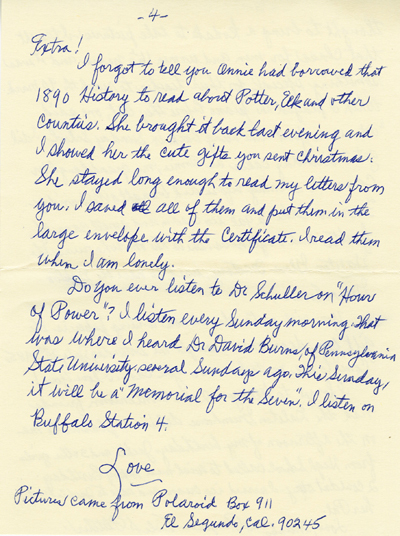 Letter from Sue to Annie, Viola’s granddaughter January 25, 1988 [Becky was working at Susquehanna University by this time, and wrote separately upon hearing the news]. – On a happy note: I was offered (and have accepted) a full-time position at PSU as Serials Receipt Librarian, effective March 1, 1988. 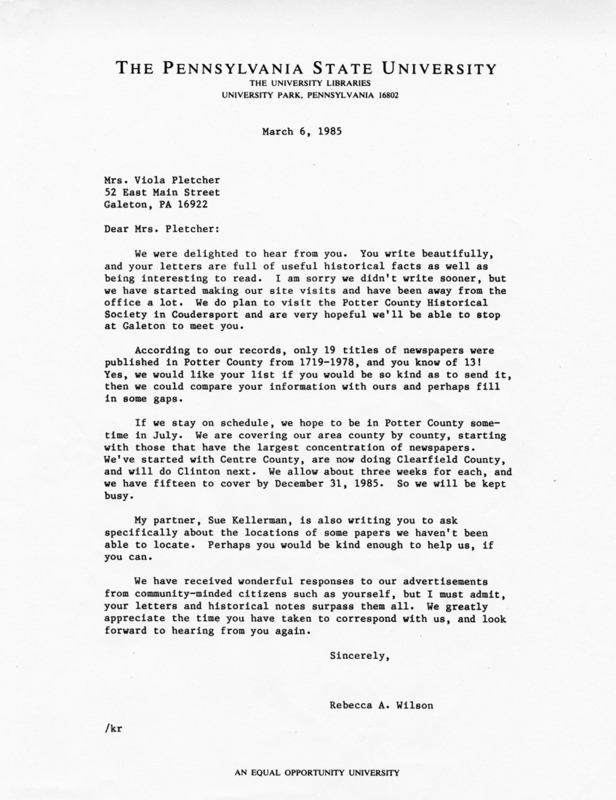 – On a much sadder note, long-time friend of the Project and ex-newspaperwoman Viola Pletcher, age 92, of Galeton, Potter County, died on January 15, 1988. 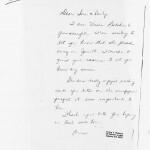 Viola followed the project initially through newspaper articles, then via correspondence with us on a regular basis. 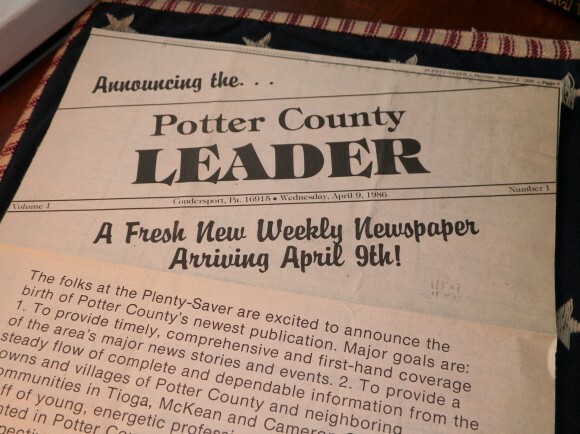 She faithfully sent us news clippings of the demise, birth, and merging of Potter County newspapers from 1985-1987, to ensure that the correct changes were recorded “in our project.” She will be missed by many. Viola Alta Pletcher, 91, of 52 East Main St., Galeton, died Friday, Jan. 15, at the Soldiers and Sailors Memorial Hospital in Wellsboro. Born Jan. 29, 1896 in Elk County, she was the daughter of William and Catherine Huffsmith. She was a member of the First Methodist Church of Gaines. Surviving are a son, Frank Pletcher of Galeton; a daughter-in-law, Evelyn Pletcher of Wellsboro; eight grandchildren; 12 great-grandchildren; several nieces and nephews; and a devoted friend, Mrs. Gladys Post of Galeton. Funeral services were conducted at the Brown Funeral Home in Galeton, Sunday, the Rev. Kent Lattimer officiated. Source : http://www.joycetice.com/clippings/tcobt165.htm (Accessed December 20, 2012).